This would seem to be an atypical view of camp life as we’ve come to know it from living history displays and popular paintings. Though images of winter camps, like those along the Rappahannock River where the Union Army of the Potomac wintered after the disaster of the Battle of Fredericksburg, are common this one was a treat to break down into details about what we know of the men and the times. This image was not attributed to a particular location or unit, but the corduroy pathways speak of a muddy spring or winter time. The corduroy planking was utilized over rough or winter roads and terrain. When Sherman’s army marched through Georgia, he split it into three columns at times and each would sometimes go through the most impassable wooded areas to avoid and confound attempts to block it along common roadways. Engineering regiments felled a swatch of trees ahead of the marching columns and those behind them stripped the limbs and laid the trunks down in contiguous roadways for the wagon and artillery units thus making their own roads. The road was not pleasant to march on, but as the logs sank they settled and made a passable road for wheeled vehicles. Late 19th century of dress in polite company was that men wore a coat when out and usually with a vest for to appear in public in ones undershirt was improper. Army life being what it was has obviously trained these men not to bother much with polite decorum. Army regulation was the soldier was to always have his sack or frock coat on and a hat when out of doors (a fact of military life even today) and when on fatigue duty one was permitted to take off the coat if needed. Further regulation was that the top button was to be fixed at all times when wearing the coat as the man to the far right is showing. Fully buttoned was to the discretion of the soldier. It is possible that the two men without their sack coats are on kitchen detail, but it is mostly the exception to find men posing for images without their uniform coats on. Another aspect, clearly seen here by the man 4th from the left is the 19th century waistline. The trousers are worn well above the hips as they are long in the crotch. With his trouser cuffs turned up there are other parts of this camp that are extensively muddy. Another way of dealing with this was to blouse ones trouser cuffs into ones socks. This is something more often seen in period lithographs like this one. This appears to be primarily a personal style choice of the soldier. The following is from reenactor discussions on the Authentic Campaigner forums: Blousing of trousers there are images of soldiers likewise accoutered and of period woodcuts, and other artist renditions. Interestingly, like other fashions it was not universal but not just a Federal or Confederate thing. 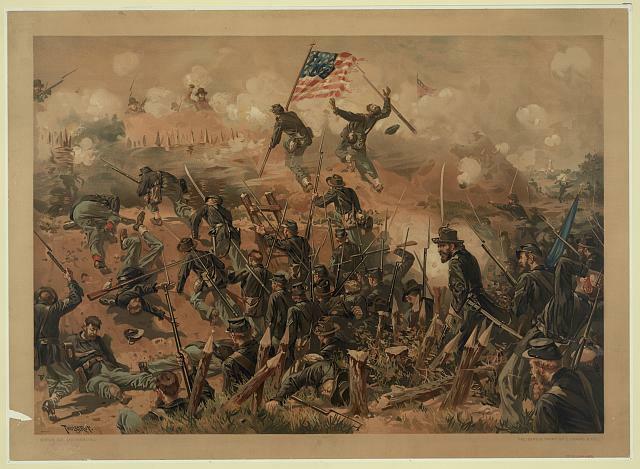 It could also be that these representations became something of an marshall image that had a visual appeal to both individual soldiers and to artists depicting scenes. At the 135th Shiloh event with the incessant rain and mud, one did find that the trouser cuffs became caked with mud, making them heavy. Often some of these questions about did they or didn’t they are answered by simply experiencing something of the soldier life and seeing what happens when one tramps through brambles. Beards, like styles in dress, were a cultural variety as seen here. The shaggy looking mountain man look as is sometimes seen (or used to be) at reenactments is not so much supported by both the decorum of the age, military discipline, and image records. Finally, the contraband slave in the picture, though fully uniformed in union kit, is more than likely a camp servant. Scenes like this are common in camp images and say a lot about the relationship between white soldiers and black servants. It is a point of acknowledgement that whites and white soldiers were more apt to appear with blacks in images when the relationships were of unequals, what is a sad thing to say today but a common enough thing for the time period. Even though he is in a uniform he is not a soldier judging by the attitudes of the men in the image and knowing that a scene like this, if a black regiment, would have been uni-racial. If any whites were in the image they would have been officers given the organization of the USCT units. NCOs would have been from the ranks of the black volunteers but the officers were one hundred precent whites. It would not be until the end of the war that the first Lieutenant was commissioned from the 54th Mass. Volunteers, Stephen A. Swails. Swails was a veteran of all of the 54th’s major battles, twice wounded, and for his leadership was commissioned 2nd Lt. in 1865 and was further promoted to 1st Lt. prior to the 54th being mustered out of service. Winter camps were long term, where active campaigning was minimal. 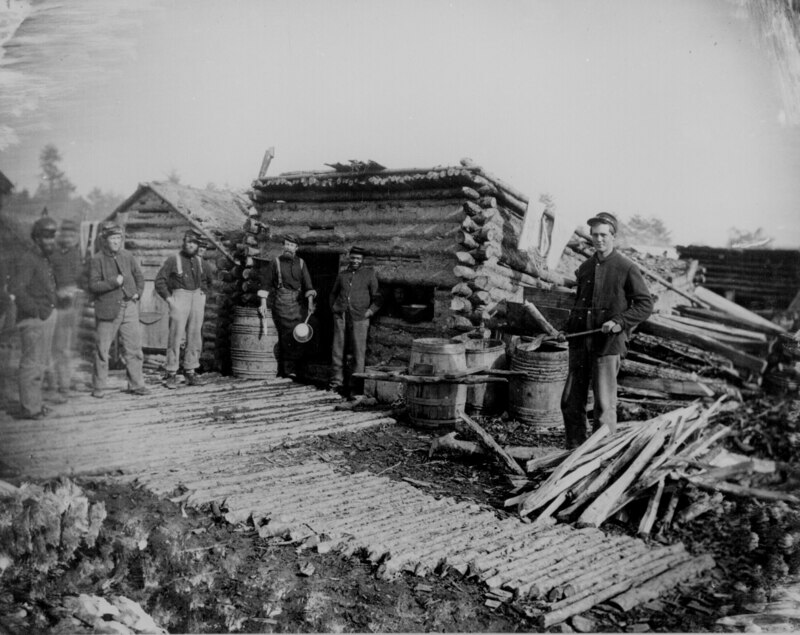 Civil War armies, depending on the area of the country, were immobile from December through February or March due to the problems of weather on the logistical needs of supply. Snow and rain, the things that produced mud on non-macadamized roads which would have been most. The longevity of a camp being based on the frequency of being moved about (even in winter quarters there was no guarantee that the hut one constructed would be the hut one was able to move into) produced such structures as seen here. #3 Amazon Best Seller ranking! This is an outstanding post on winter camp, Phillip! I’ve heard stories of tremendous snow ball fights breaking out in camp (some lasting for days) when the men got bored. Hubz and I look forward to reading your book. We’re going to order it when we order our bi-monthy book order. Thanks! I look forward to what you have to say about it. Great article! Thanks for putting in the time to do this! You’re welcome. These are great to put together and allow for a variety of information sharing. Hurray! First pic I’ve seen of a “corduroy” road. Pretty much the way I imagined. This would be what it would have looked like, true. Imagine it for miles stretching through swamps and forests! Makes me motion sick just to think of it. How funny; I think I’d seen that but not really paid much attention to what it might be. Unquestionably consider that that you stated. Your favourite reason seemed to be at the net the simplest thing to be aware of. I say to you, I definitely get annoyed at the same time as people think about issues that they just do not realize about. You controlled to hit the nail upon the highest as smartly as defined out the whole thing without having side-effects , other folks can take a signal. Will probably be again to get more. Thanks! At least one source has identified these men as being from the 6th New York Artillery. I seriously doubt this as close inspection seems to indicate the presence of the Infantry hunting horn on several forage caps. Of particular interest is the barrell with attached handles for carrying to the left of the soldier with the axe. These old images are gold mines of hidden information. Truly fascinating. Next Next post: Band box, paper collar soldiers; literally.